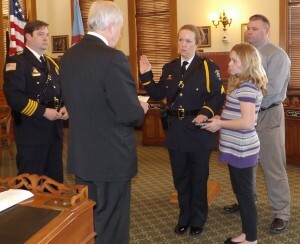 Mayor Tom Gillen swears in new OPD sergeant Lorie Burger. Her daughter, Emma holds the bible. Looking on are the sergeant’s husband, Chuck, at right, and OPD Chief Tory DeCaire. 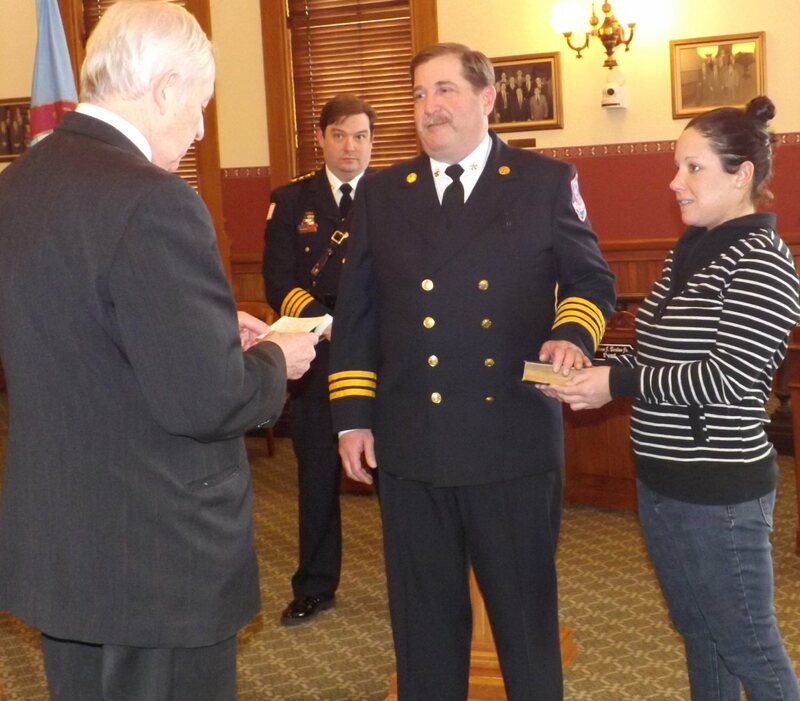 OSWEGO, NY – The Oswego City Fire Department increased its ranks by four and announced two promotions Wednesday afternoon. During the same ceremony, the Oswego City Police Department welcomed six new officers. They also announced five promotions. Mayor Tom Gillen welcomed everyone to the standing-room-only ceremony in the Council Chambers at City Hall. 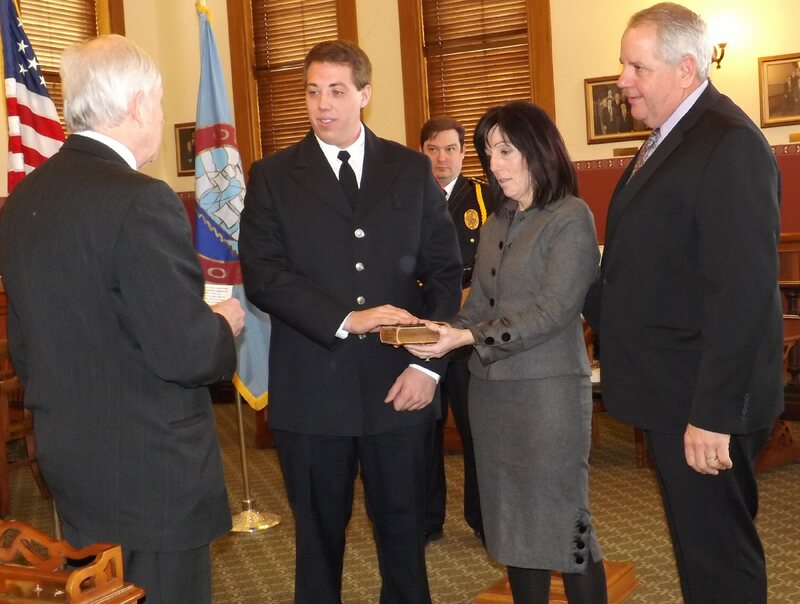 Sworn in as firefighters were: Kevin Davis, Jordan Patrick, Anthony Sterio and Matthew Alton. Peter Coffey was promoted to the rank of deputy chief. 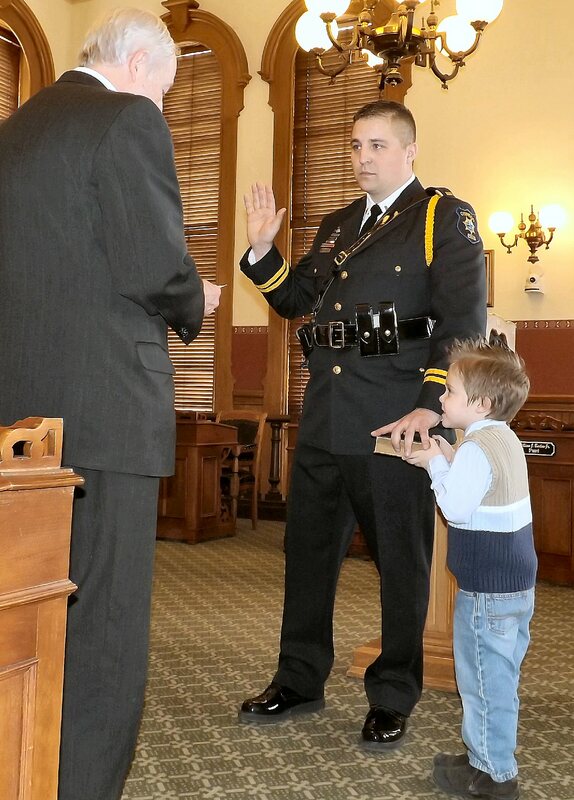 Anthony Sterio joins the ranks of the Oswego Fire Department as his parents, Mytris and Mike, look on. Mayor Tom Gillen administers the oath. In back is OPD Chief Tory DeCaire. Jon Chawgo was promoted to the rank of assistant chief. The police department also welcomed some new officers. Sworn in as police officers were: Matthew Zaccaria, Jaime Nielsen, Trevor Williams, Justin Grasso, Lysa Dolin and Tom Grover. John Chodubski, Lorie Burger and Tom Rupert were promoted to the rank of sergeant. Zac Misztal and Chris Pooler were promoted to the rank of lieutenant. Peter Coffey is promoted to the rank of OFD deputy chief by Mayor Tom Gillen. He is accompanied by his stepdaughter, Shannon Farden. In back is OPD Chief Tory DeCaire.